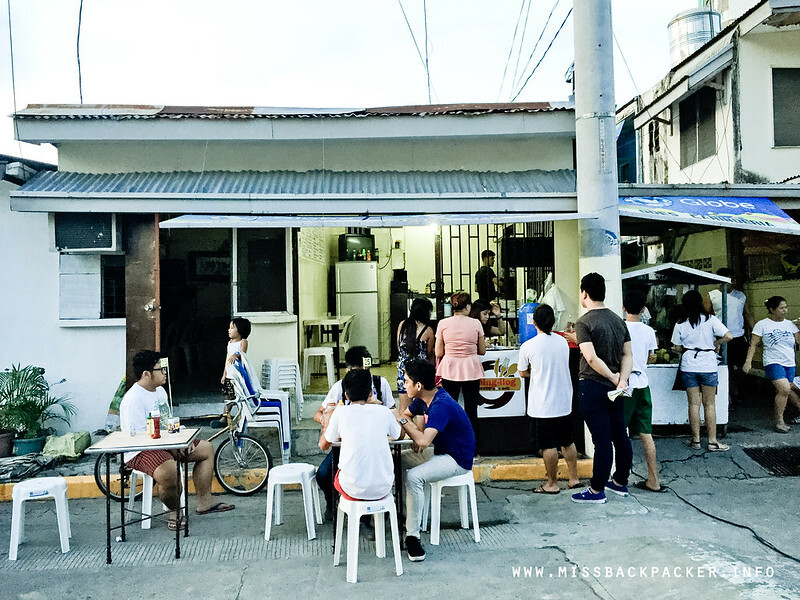 Foodspotting: Tabing Ilog in Mandaluyong City | Where Have You Been Lately? 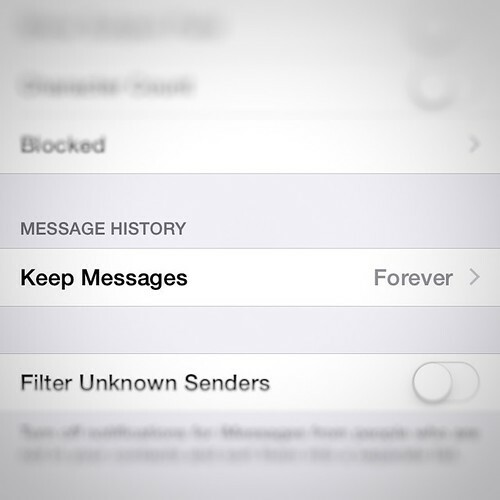 I don’t know how the walang forever craze started in the Philippines but it’s definitely not true, that there is no forever. 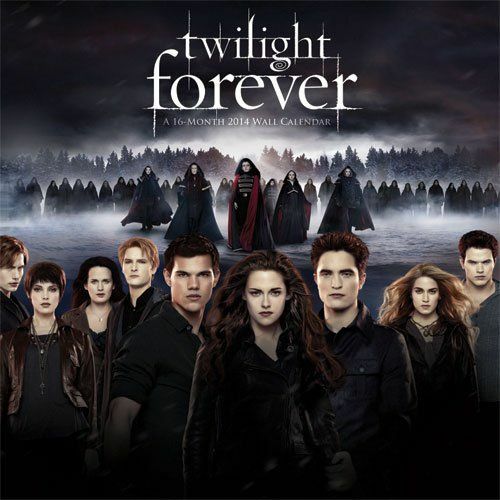 Others were able to find proofs that forever exists. And some of these are downright funny. Have a look! And you know what, I also found forever in Tabing Ilog in my city of Mandaluyong. Tada! Everyone, meet May Forever. Sorry to rain on your parade, but it’s not the romantic forever that you think. It is actually a noodle pasta served with white sauce, cheese toppings, bacon bits, chicken strips, and garlic bread. And this forever comes really cheap at Php 45.00! Great deal, right? 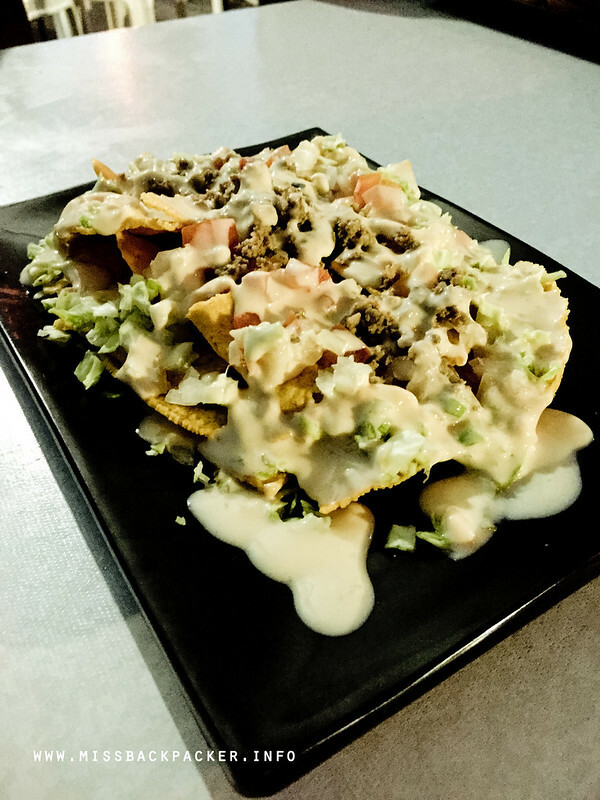 Nacho chips, ground beef, vegetables, cream cheese. There is nothing really special with this appetizer, but I am liking the fact that it’s topped with cream cheese instead of the traditional grated cheese as it didn’t make it boring and made my eating experience more enjoyable. The nacho chips that were used were crispy and you’d know that it had not sat on the shelf for a long period. Twister fries with dip. Yep! 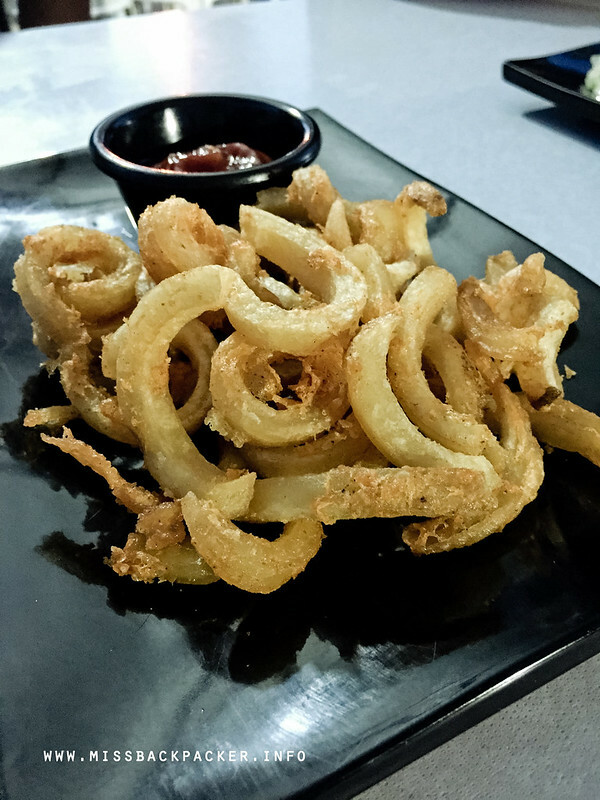 You don’t have to wait for McDonald’s version of it before you can munch on these curly fries. Again, nothing special but it’s served while it’s still hot. Actually, all of their dishes are cooked as you order so you won’t have to worry about it being microwaved. EDI WOW (Php 75.00) MUST TRY! Quarter pounder patty with cream cheese, mushroom, bacon, TLC, and fries. Oh geez! This! 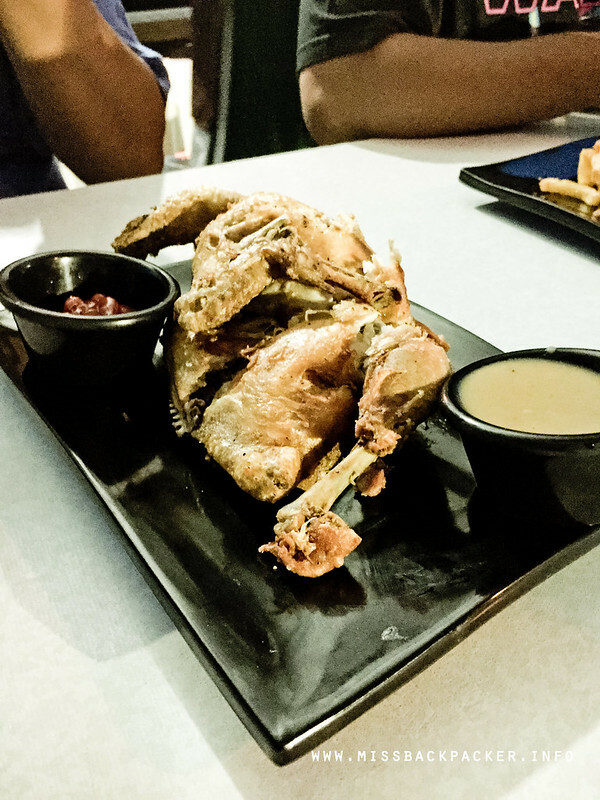 It’s gigantic that two person can share eating one order of Edi Wow making it one of the restaurant’s best-sellers. 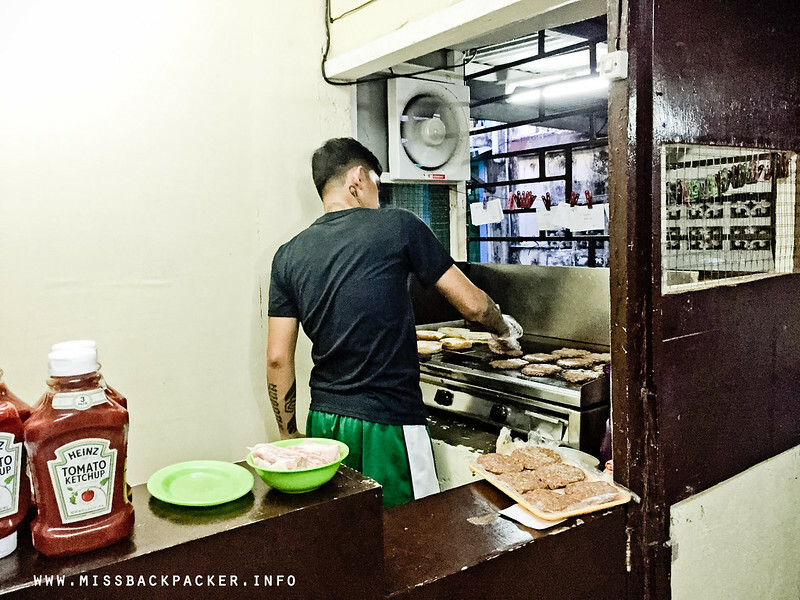 According to owner Tita Lourdes Castillo, Tabing Ilog boasts of their burgers because they only use pure and fresh beef meat without any extender or filler. 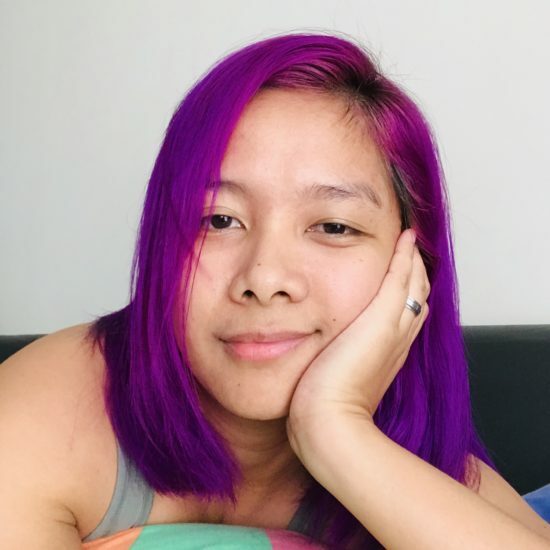 Eh ‘di wow talaga! 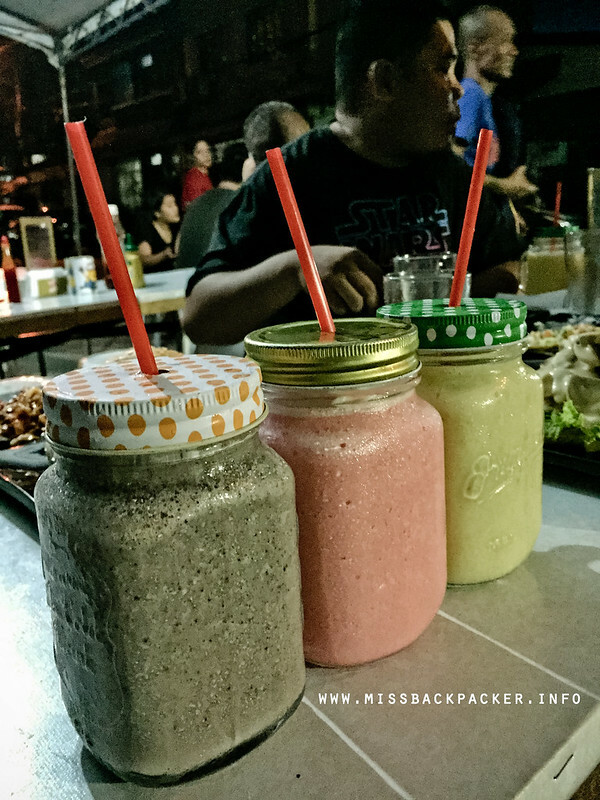 Pampakalma D (Php 35.00) – Cookies and cream-flavored shake MUST TRY! Why spend a lot on expensive fruit shake that is served in the same boring plastic cups when you can have the same, if not better, at half the price and placed in cutie patootie mason jars? My husband really loved Pampakalma D so I am recommending it. Max’s style fried chicken with ketchup or gravy dip. This and TILAOK (bucket of 6 fried chicken) are food to go and for delivery only. 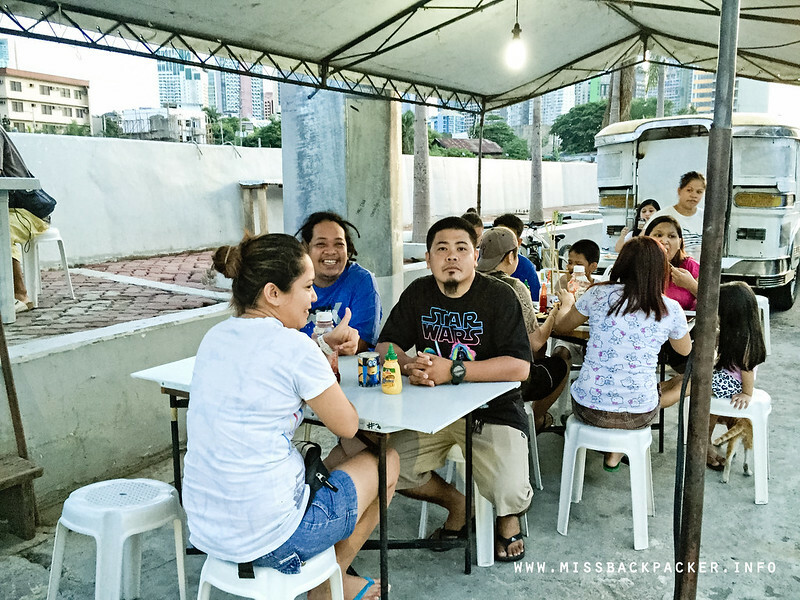 The Tabing Ilog management was kind enough to let us taste their fried chicken even if we were dining in. It didn’t disappoint and it lived up to its advertising of being comparable to Max’s chicken. Noodles with red sauce and garlic bread. Of course, to appease the haters and melancholic, Tabing Ilog also named one of their dishes as such. Contrary to how it is named, Walang Forever didn’t portray sadness or bitterness. 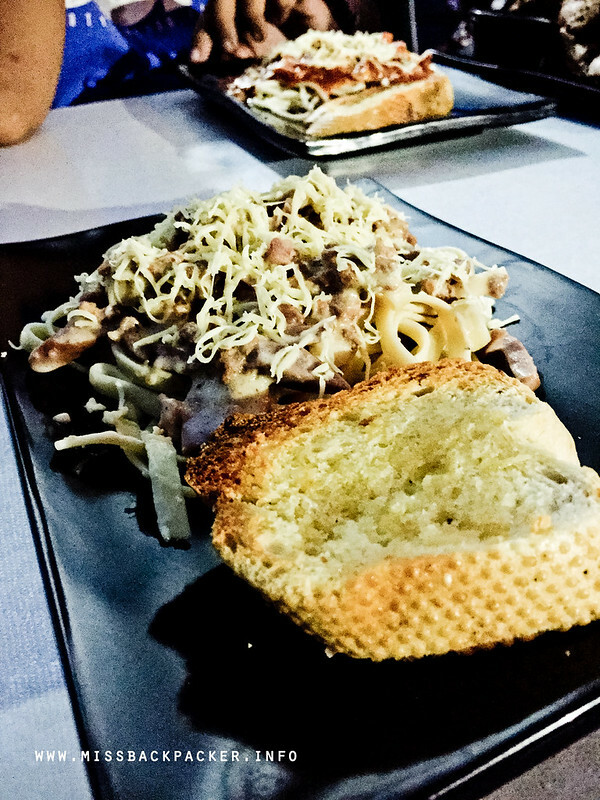 In fact, it’s kinda the perfect Filipino-style spaghetti with a touch of sweetness. Now, if what we tried didn’t interest you, have a look at their menu that was created by son and co-owner Donny. Let it change your minds. Donny named the menu as such with the sole intention of making it memorable and pop. 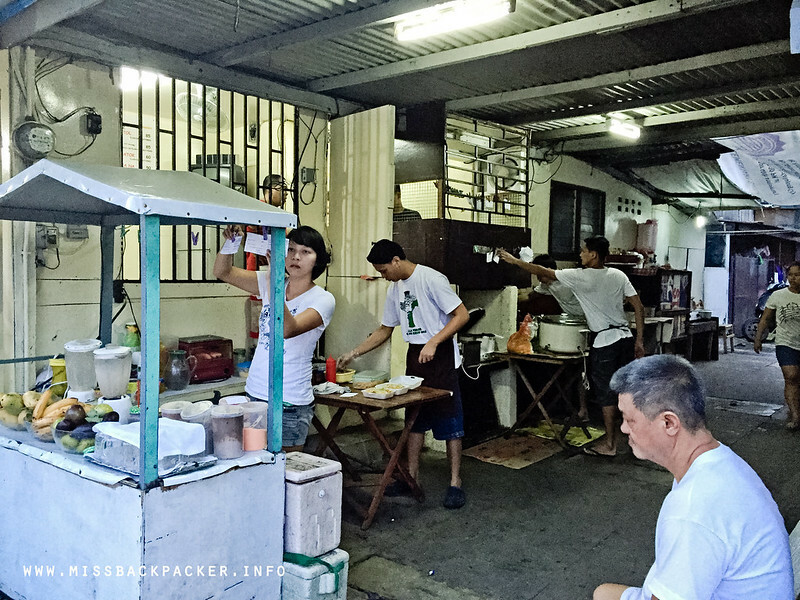 Tabing Ilog, named after its location, operates on a daily basis from 4:00 PM to 12:00 midnight. Basing on the number of customers during our visit, I asked Tita Lourdes if Sunday is their busiest and to my shock, she said no. 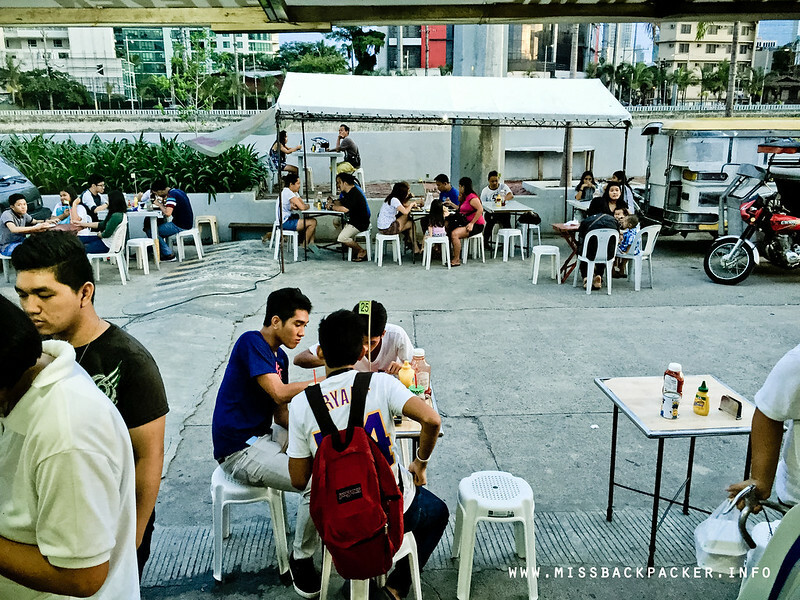 The place becomes really crowded with students during Mondays, Fridays, and Saturdays. 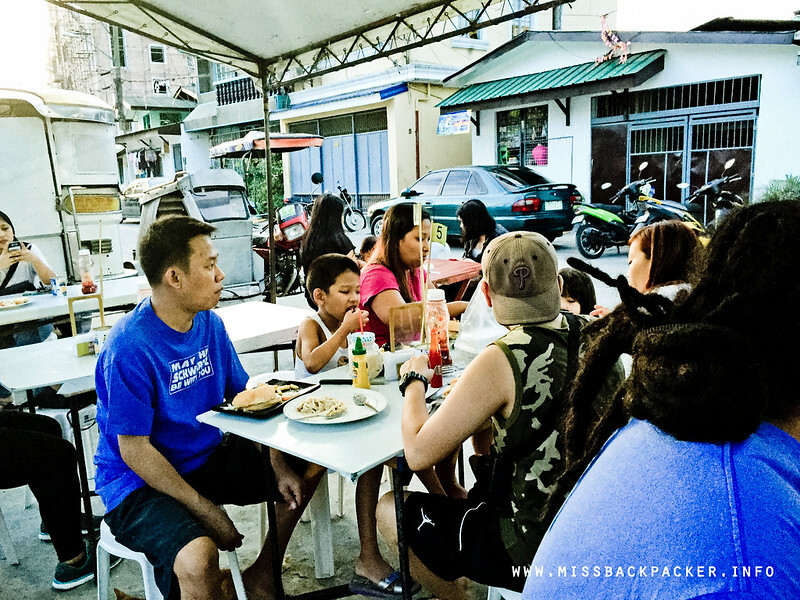 Sunday, apparently, is just an average day in Tabing Ilog. Wow! Can you imagine that? For a food spot to have just started operating in less than two months with this volume of crowd says a lot. This was taken on a Sunday at around 6:00 PM. And this one, at 7:00 PM with still a lot of people on queue. Here are more photos of the place. 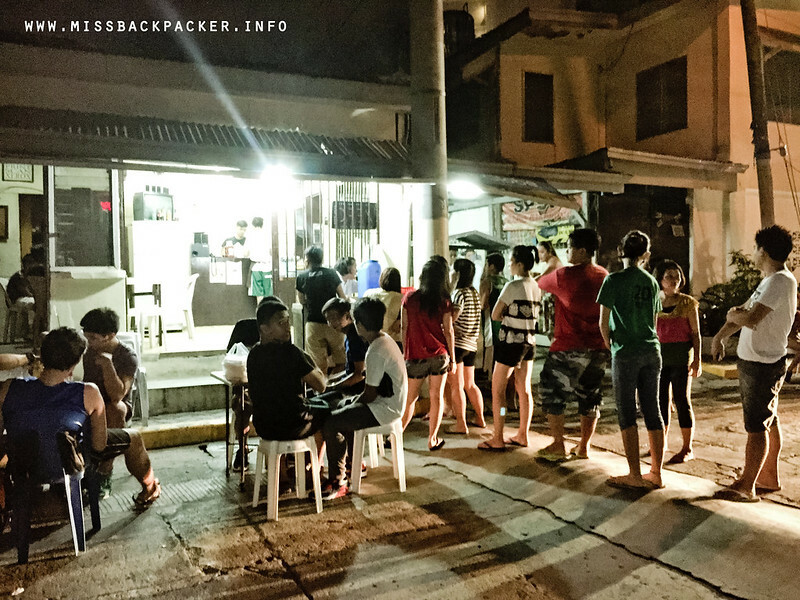 Though burgers and pasta sound nothing new to you, there are several things that I love about Tabing Ilog. First is its location. It is spacious unlike other food spots in Mandaluyong na kulang na lang eh maghiraman kayo ng mukha ng katabi mo, it has a nice view of the Makati skyline specially at night, it is easy to find, there’s no standing while waiting as you get accommodated as soon as you arrive, and there’s a lot of room for parking. I also love that the place is highly organized. 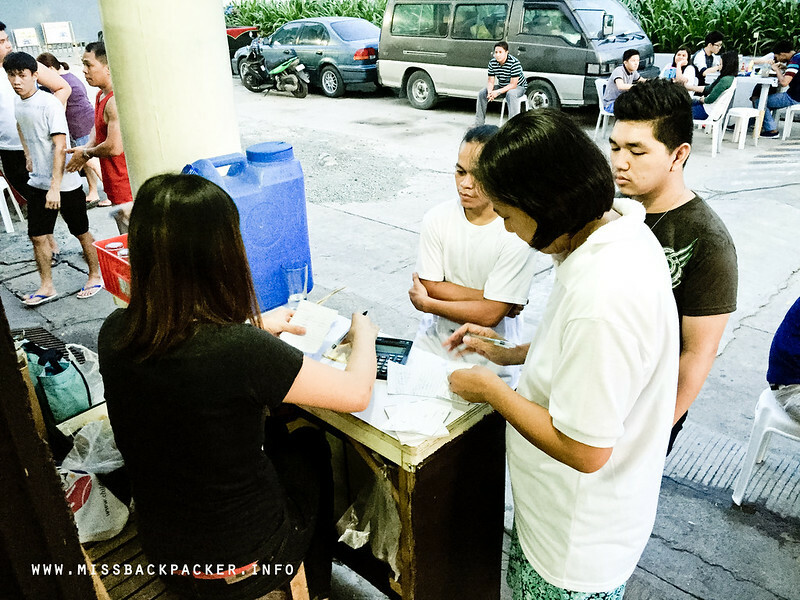 You choose from the menu, line up for your payment (if there are other customers ahead of you), and wait for your food to be served, which doesn’t take long compared to other Mandaluyong restaurants that I won’t bother mentioning. Then there is a wide variety of food you can choose from. 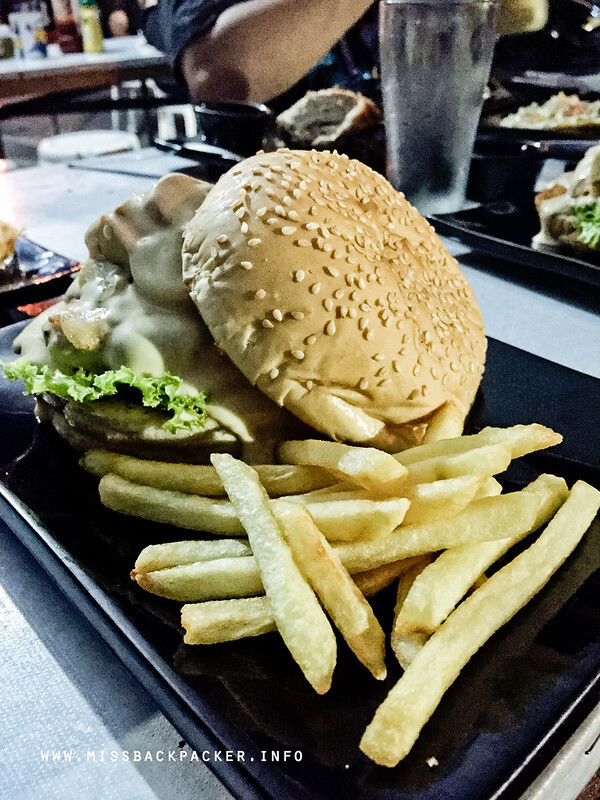 They don’t just serve burgers and pasta, you can also have rice meals, cakes, and even sizzlers. And the last thing is the food prices. 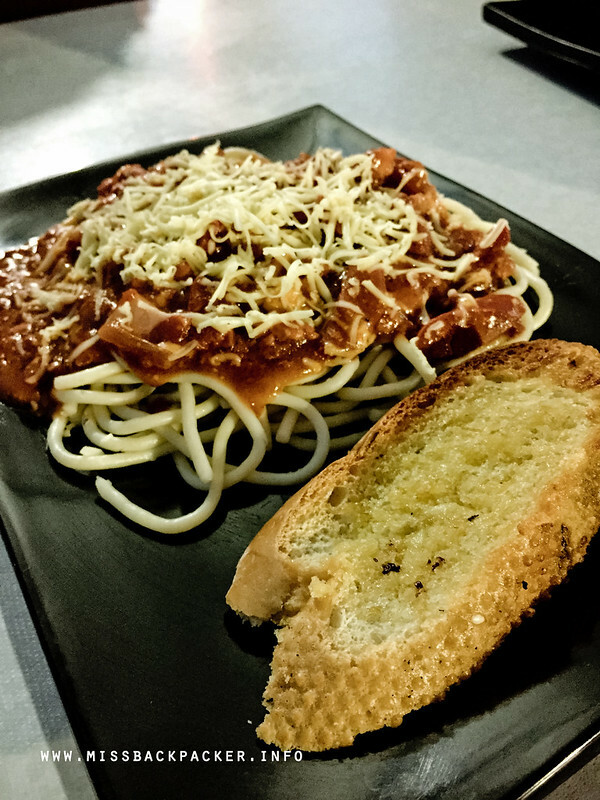 It’s very often that you can find a restaurant or eatery serving a decent- size and flavorful spaghetti for just Php 45.00. 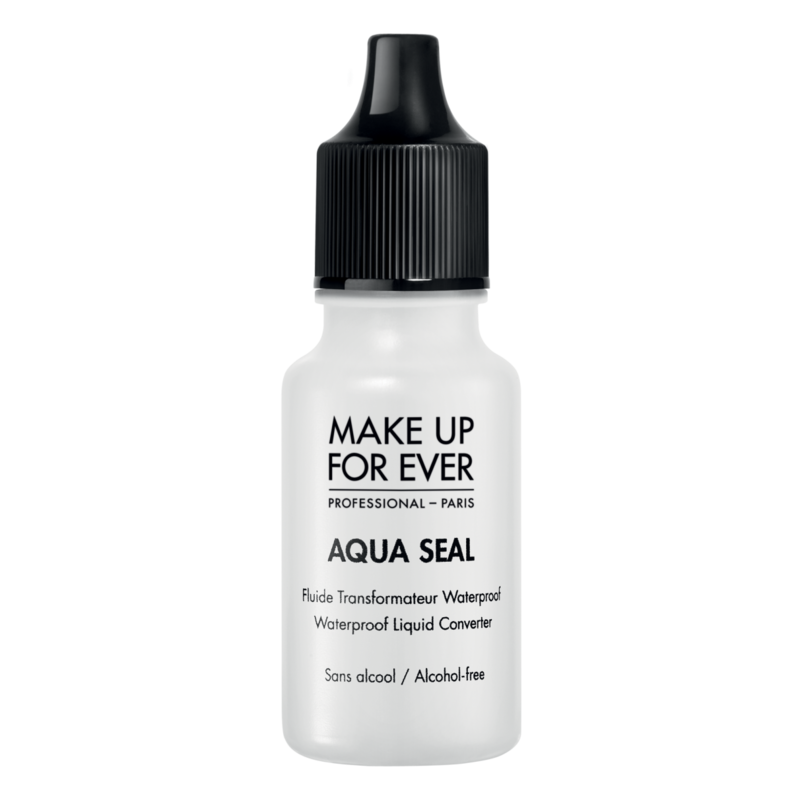 In most cases, it can either be expensive or less in quality or quantity. 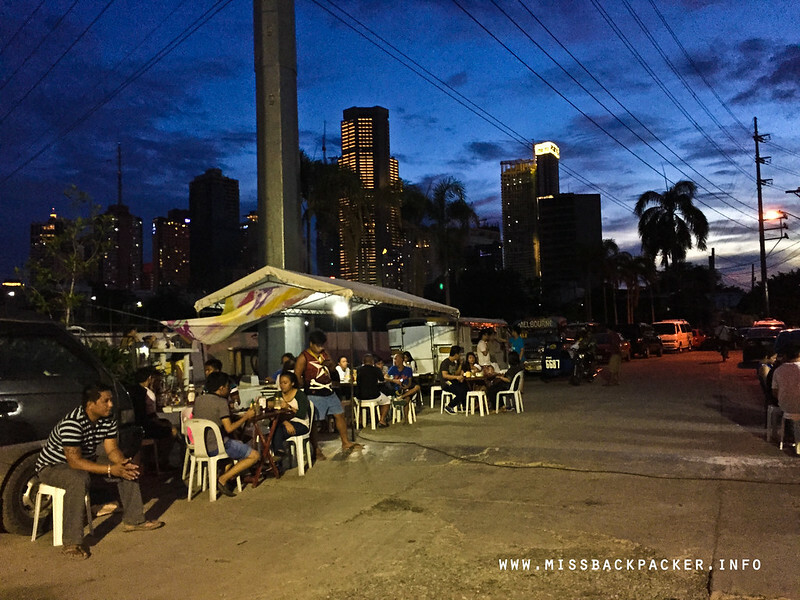 Great view of the Makati skyline. The only downside of dining in Tabing Ilog is during the rainy season. 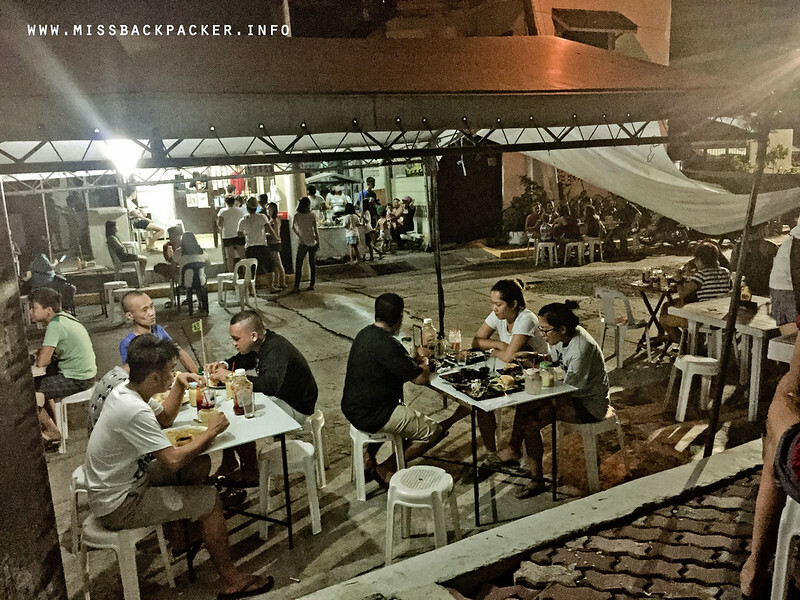 As the photos show, you can get really wet if you want to dine here when it’s raining. Don’t worry though. As a solution, they offer free delivery. 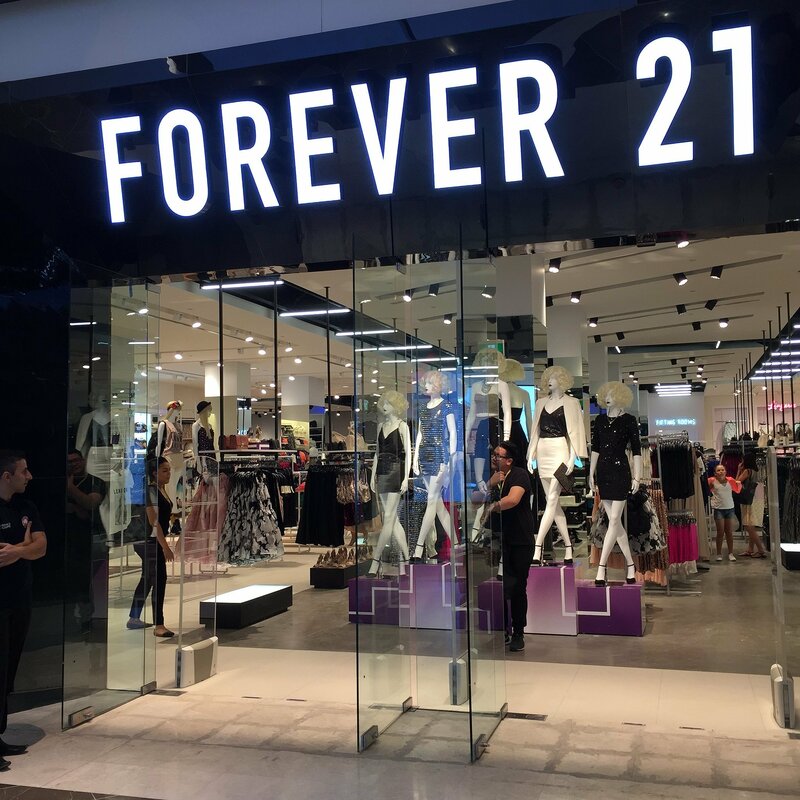 Tita Lourdes also says that they already are investing on having a second floor done in the soonest time to accommodate more customers regardless of the weather. So there, may forever sa Tabing Ilog! 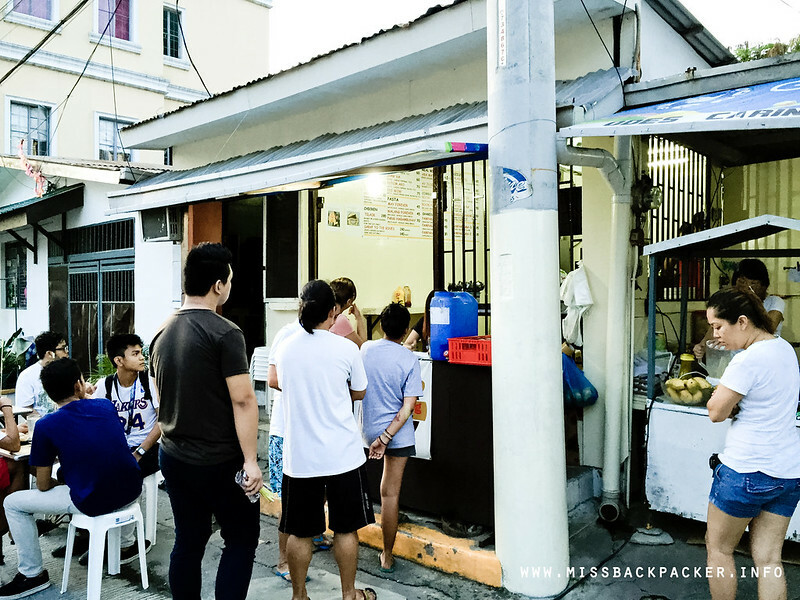 If you’re a Mandaluyong food spot owner and you wish for a special feature or for your place to be added on my Offbeat Manda Gastro Treats list, please email me at hello@missbackpacker.info or use the contact form, which can be found here. 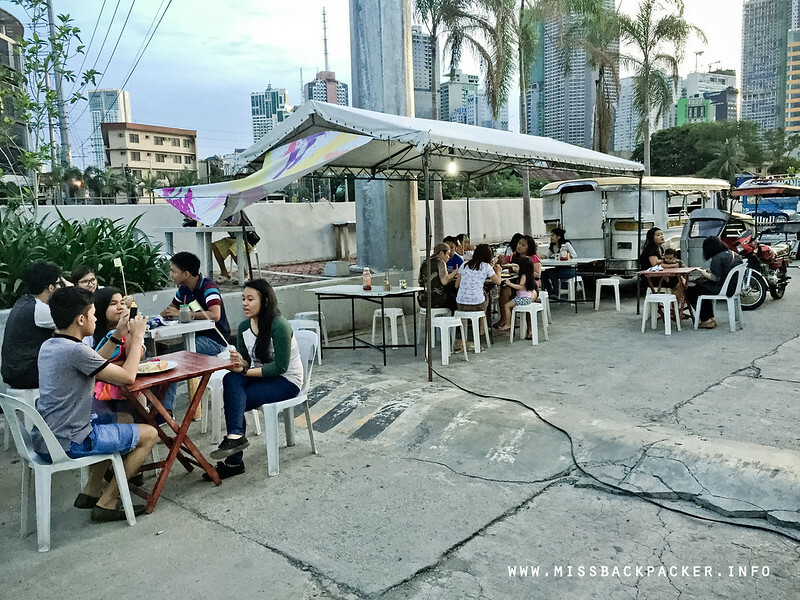 Thank you so Much for this wonderful Blog Misspackaper 😉 Highly Appreciated. God bless always.